In Articulate Quizmaker, you have complete control over the ordering, grouping, positioning, and sizing objects. Go to the Home tab, and click Arrange. 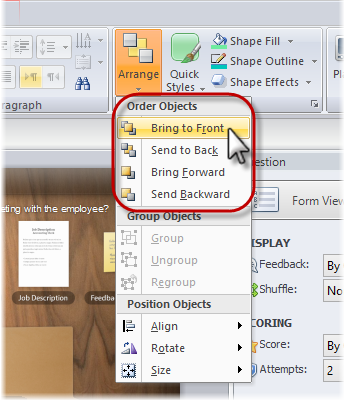 Then select Bring to Front, Send to Back, Bring Forward, or Send Backward. Go to the Format tab, and click Bring Forward or Send Backward. 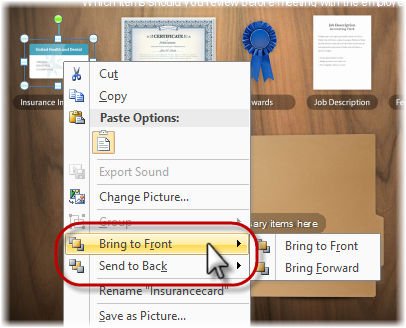 Click the arrow next to either option to Bring to Front or Send to Back, respectively. Use the timeline that appears below your slide to reorder objects. (If the timeline isn't visible, click the Timeline and Notes bar at the bottom of the screen to expand it.) All the elements on your slide will be listed on the timeline in the same order in which they're layered on your slide. Topmost items are closest to the front, or top, layer of the slide. To change the layering order, just select an item on the timeline and drag it up or down the list. Right-click an object and choose Bring to Front or Send to Back. Grouping is a handy way to move, size, rotate, flip, or change other attributes of multiple objects at the same time—as if they're a single object. Go to the Home tab, click Arrange, and choose Group. Go to the Format tab, click the Group drop-down, and choose Group. 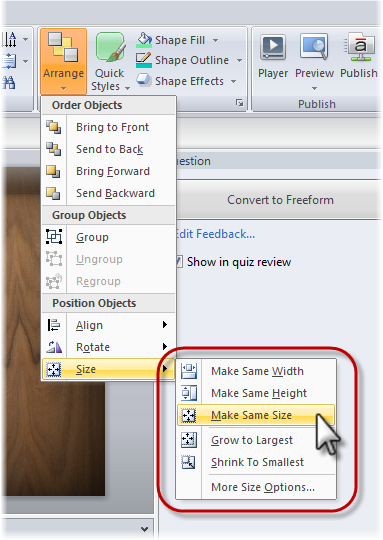 Right-click the selected items, scroll to Group, and choose Group. Go to the Home tab, click Arrange, and choose Ungroup. Go to the Format tab, click the Group drop-down, and choose Ungroup. 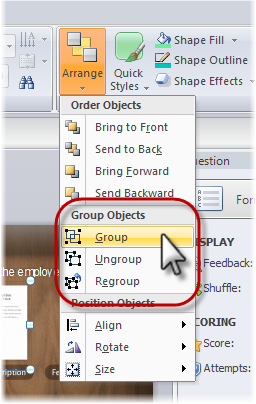 Right-click the grouped object, scroll to Group, and choose Ungroup. Go to the Home tab, click Arrange, and choose Regroup. Go to the Format tab, click the Group drop-down, and choose Regroup. 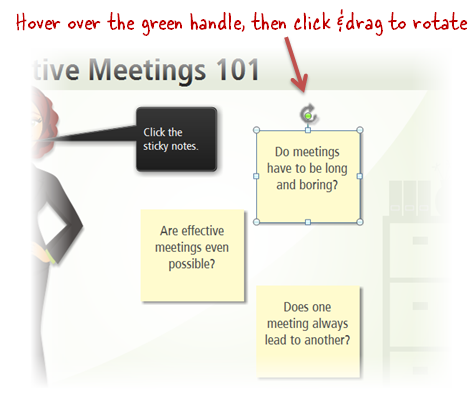 Right-click the selected objects, scroll to Group, and choose Regroup. It's easy to position objects on your slide by just by dragging them. But if you want more control over alignment, do the following. Select one or more objects to align. Go to the Home tab, click Arrange, and scroll to Align. Or, go to the Format tab, and choose Align. 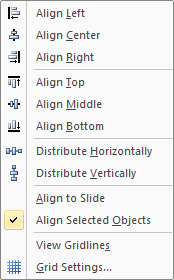 Then choose either Align to Slide or Align Selected Objects. Then choose one of the alignment options (left, center, right, top, middle, or bottom). Or, if you'd rather space the items evenly, choose Distribute Horizontally or Distribute Vertically. To rotate an object, select it, and drag its green rotation handle. Go to the Home tab, click Arrange, and scroll to Rotate. Or, go to the Format tab, and choose Rotate. Then choose one of the rotation options listed, or choose More Rotation Options to enter a specific value. If you choose More Rotation Options, you'll see the following window. (Another way to get to this window is by right-clicking the object, choosing Size and Position, and selecting the Size tab.) Enter a value in the Rotation field or use the arrows to adjust the value. Click Close when you're done. The quickest way to resize an object is to select it, and then drag any of its sizing handles. Here are some tips if you use this method. To preserve the aspect ratio while resizing, hold down the Shift key while dragging a corner handle. To resize opposite sides of the object equally, hold down the Ctrl key while dragging a side handle. For more control over an object's exact size, select it, go to the Format tab, and enter your preferred values in the Height and Width fields. Select all the objects you want to resize. Go to the Home tab, click Arrange, and scroll to Size. Choose one of the sizing options listed.